Prepare KELLOGG&rsquo;S EGGO Minis Buttermilk pancakes according to package directions. Cut one of the pancakes in half. Tear remaining pancakes into bite-size pieces. 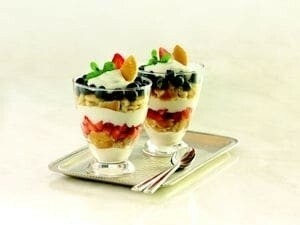 In two 12-ounce parfait glasses alternately layer yogurt, pancake pieces, strawberries and blueberries. Top each parfait with one pancake half. Garnish with mint (if desired).